This article contains spoilers for the sixth season of Game of Thrones relating to the character Lyanna Mormont. Read our full recap of her debut episode, and go to "Beyond the Wall" for more Thrones recaps, theories, and spoilers. 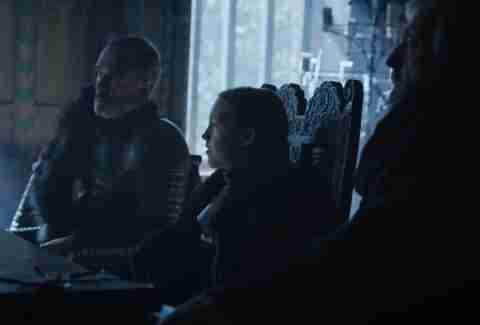 In "The Broken Man" episode of Game of Thrones, we finally met Lyanna Mormont, the Lady of Bear Island and niece of the late Jeor Mormont, Lord Commander of the Night's Watch. Her only scene in the episode lasted just three minutes, but that was all this 10-year-old spitfire needed to steal the whole shebang. 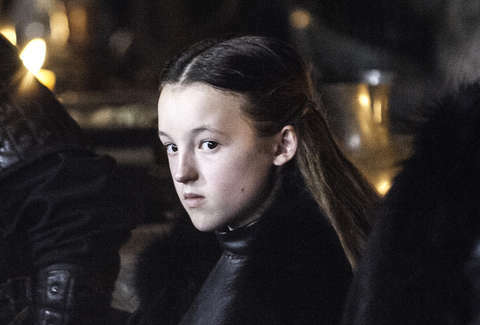 Lady Mormont, played by newbie Bella Ramsey, proved that youth is no excuse for poor leadership (*cough* TOMMEN *cough*). The pint-size actress nailed the commanding attitude necessary to survive and prosper in the world of Thrones. Twitter lit up over her defiant speech to Jon, Sansa, and Davos' request for support on the battlefield. "We were excited about the prospect of the character, because she's mentioned in passing in the previous season," co-showrunner D.B. Weiss tells us in the after-episode commentary. "The more we thought about it, Jon is gonna come up against so many old guys with beards in the North, that, like, what if she was a tougher audience?" Tough doesn't even begin to describe Ramsey's performance. Weiss added, "It also was terrifying because it's putting a lot of dramatic weight on the shoulders of somebody who needs to be very young, and we're very lucky to have found Bella because she is doing such a great job of just talking smack to these guys who are used to being the heroes who make proclamations." And he wasn't the only one blown away: as co-executive producer Bryan Cogman said in an interview with Entertainment Weekly, "Bella is a terrific young actress -- the whole cast and crew were very impressed. I think, much like the character does with Jon, Sansa, and Davos, Bella kept Kit, Sophie, and Liam on their toes!" After her appearance on the world's most talked-about series, which also saw the young actress rally the troops of the North in support of KING Jon Snow, Bella is on the brink of TV stardom. She's starring in the TV adaptation of the 1986 movie based on Jill Murphy's book series The Worst Witch, which debuts next year on the kiddie offshoot of the BBC. It's currently filming in Cheshire, England, and undisclosed locations in Germany. Bella hasn't revealed any roles beyond that one -- but hey, she's already accomplished a lot more than we had when we were in grade school. So let's say it together: Lyanna Mormont, by way of Bella Ramsey, won Season 6 of Game of Thrones. And if you want to disagree, beware: we brought an army. Lauren Leibowitz is Thrillist’s Entertainment editor and she's been practicing Lady Lyanna's "talk to the hand" gesture all morning. Find her on Twitter: @lleibowitzz.